The cirrocumulus castellanus occurs when a large mass of air lifts, and subsequently followed by an instable condensation. This is why the castellanus is often related to instability in weather. Although this type of cloud is an indicator of instabilities in atmospheric weather conditions, it shouldn't be mistaken for a rain cloud. Like all other cirrocumulus clouds, the castellanus creates a vigra, or a precipitation of mixed rain and snow that evaporates before reaching down the surface. This is the reason why lighter clouds often form beneath the cirrocumulus clouds. 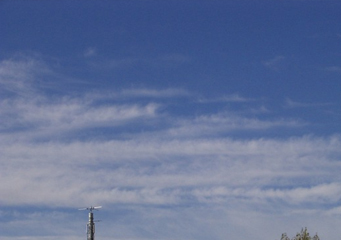 How common are cirrocumulus castellanus clouds? Among all sub types of cirrocumulus clouds, the castellanus is widely distributed. It can be seen worldwide, at an altitude above 16,500 feet and below 39,000 feet. The other classes of the castellanus subspecies can be seen as low as 6,500 feet, such as the altocumulus castellanus. There are many similarities between these cloud types, but there's a number of distinctions as well. These two cloud types should not be confused with one another. These clouds are very large by comparison to other types of clouds. However, their location in such high altitude makes them seem smaller than they really are. The cloudlet, which look like fingers of the large cirrocumulus clouds, for example, appear to be nothing but wisps on the edges of cirrocumulus clouds. The castellanus is a cold cloud. As high as it is on the atmosphere, the water already crystalizes, although it doesn't freeze just yet. The crystallization of the water is enough to create ice flakes up in the atmosphere. These flakes remain suspended until there are enough of them to cause precipitation. This precipitation does sometimes fall as rain or snow, though rare. In most cases, the precipitation will simply fall as vigra. How are cirrocumulus castellanus clouds formed? The cirrocumulus castellanus forms from the base of old clouds. These clouds are usually good-weather clouds that are becoming too heavy as of late. They turn to mild-weather clouds, then. Even though the castellanus isn't a storm cloud itself, it points to bad weather development, probably a thunderstorm or a snowfall later in the day or week. The atmospheric development is always a variable. No one can say for certain that heavy rain is going to fall just because there was a castellanus in the sky. It's important to note, too, that thunderstorms are not directly related to this type of cloud. Castellanus, like all other clouds of the cirrocumulus type, occurs when one layer of colder air glides across an area of altocumulus or cumulus clouds. Alternatively, these clouds can occur as said above, through the transition of good-weather to bad-weather clouds. What do cirrocumulus castellanus clouds look like? All cirrocumulus clouds are distinguished by their unique tuft-like appearance. The name is derived from two types of clouds: one, the cirrus clouds which are high altitude clouds, and two, the cumulus, which means clouds with the fluffy cumulus appearance. This type has many subtypes, which are then classified according to the relative shape, size, color and various weather indications. These subtypes are not to be confused with one another, although they might look very similar.